When two friends reunite around a huge pot of brodetto, it’s always a memorable evening…especially when both of them are craving fish and seafood. I grew up eating brodetto, my mom’s favorite. 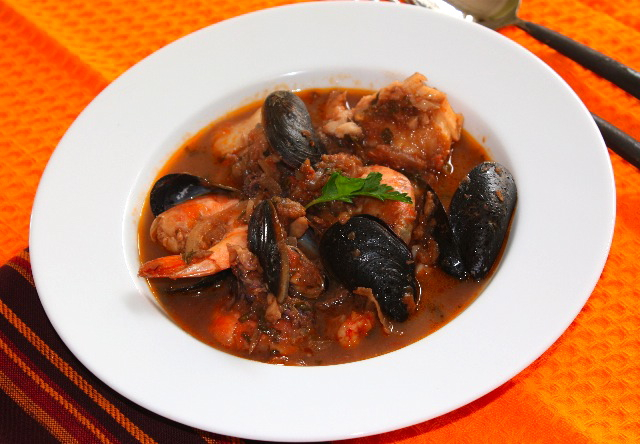 The city of Fano in Italy and that particular region, being on the Adriatic Coast is well known for their seafood dishes and brodetto is one of them. Brodo means broth so, brodetto being a diminutive, means small broth, the fish is not drowned in liquid nor in heavy tomato sauce, like some stews you can eat at some restaurants, there is enough broth to dip bread but it’s not soaking in it. Brodetto is very famous in Marche region of Italy Usually for a traditional brodetto, you need at least 12 different kinds of fish and shell fish but mainly the kind you can only find in the Adriatic sea such as “triglie, “teste grosse”, “rospo”, “trofano”, etc… which I don’t know the equivalent in English. There was somehow a limitation of fish available so I somehow used fishes I could find but the brodetto ended up being quite delicious. You need extra fresh and top quality fish, that will make a big difference. The quality and ripeness of the tomatoes are also very important, so if you don’t have top ripe tomatoes, you can use imported can tomatoes such as San Marzano, but if they’re whole, you’ll need to crush them ino a purée. I used balsamic vinegar, that’s why my broth is a little darker, nonetheless delicious, balsamic vinegar being a little sweet gave the broth a very distinct flavor. A clay pot is perfect to cook this type of dish, it allows all the flavors to infuse beautifully together. For Italian speakers, you can read this website “L’Academia del brodetto” where they somehow explain the differences between brodetti made in different regions and listing the best restaurants serving brodetto, so in case you find yourself in Italy on the Adriatic Coast, you can go and try the best restaurants serving brodetto…of course if you are crazy about sea food like I am. In a clay pot preferably, heat olive oil, then add onion slices and let them cook slowly until they become soft and almost caramelized, add garlic and stir, cook for 5 minutes without burning the garlic. Add vinegar and let it reduce. Add parsley. Mix well – Add tomatoes and let the mixture reduce and thicken. When the sauce has reduced, add squid cook for 5 minutes, then add fish, let it cook for 5 extra minutes, and add shell fish at the end. Adjust with salt and pepper. The mussels are cooked last, after adding mussels, cover with lid and remove from heat when the mussels have opened. Mix broth carefully. The fish needs to be cooked but not overcooked. The vinegar will prevent the fish from breaking apart. Serve in deep dishes with slices of country bread. This entry was posted by silvia on February 24, 2010 at 7:41 pm, and is filed under Fish/Seafood. Follow any responses to this post through RSS 2.0.You can leave a response or trackback from your own site. I have been buying San Marzano canned tomatoes ever since you suggested using them in one of your prior posts! I now believe that when cooking a special dish(like this one with your friend) it deserves San Marzano tomatoes. The dish sounds absolutely delicious. I will surely be printing it and will give it a try – perhaps with my brother and sister-in-law. By the way, great tip on the use of vinegar in the recipe. P.S. I still have to find out the name of the wild mushrooms we used to forage growing up. I’ve taken this before! Truely a yummy seafood dish. And the recipe seems so easy and simple. Thanks, Silvia. 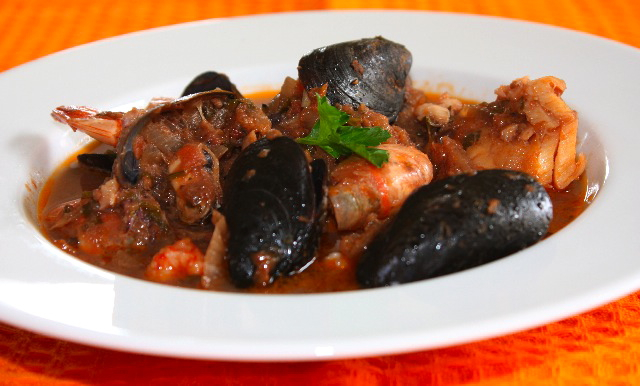 This is my kind of stew – seafood stew. I’m crazy about seafoods too. So much seafood can only be goodness. This would have to be one of my favourite dishes. It sounds like the perfect dish to share between friends Silvie. Nothing to complicate the flavors of the fresh seafood—perfect! I could just jump into the seafood stew and swim around and eat my way out of it. Mmm. Absolutely delicious recipe. Must be tried by everyone!